Hello, I have the following error after updating to this new version. My version of PHP is 5.4.31. Can the problem lie there? The variable $nda contains the result of a database request, the request for the value of mlf2_temp_infos.next_daily_actions that ssems not to exist in your database table. Did you install the version 2.4.19 or did you an update from a previous version of My Little Forum? 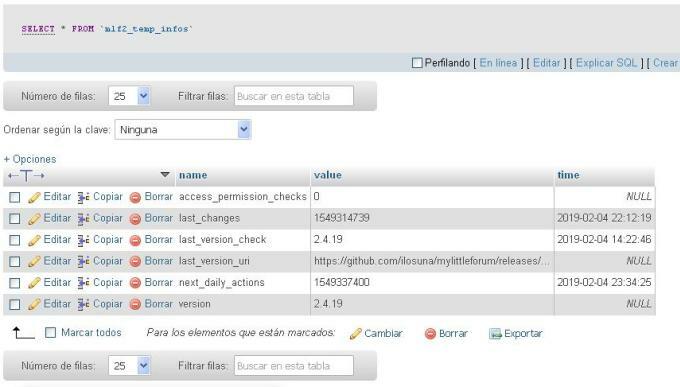 If you have access to your database with a tool like phpMyAdmin (in doubt ask your hosting company) please read the value of the row with the name "next_daily_actions" in the database table "mlf2_temp_infos" and show us the result of your investigation. The begin of the name can differ, if you changed the database prefix (in my example: "mlf2_" in "mlf2_temp_infos") during the installation. Ok, the table exists, the relevant dataset exists in the table, but nevertheless the database request for the dataset got no result. Undefined offset 0 of your error message says, that there is no element $nda, what equals to "there is no first dataset". When you run the following database query in the SQL-tab of phpMyAdmin, what is the result? Good afternoon and thank you very much for your interest in helping me solve my problem. I made a new clean installation and I kept giving the same problem and I think it will be because of my local server which is very outdated. What I did next was to make a clean installation but with the "install.sql" of version 2.4.18.1 and everything works perfect, but of course, in "mlf2_temp_infos" the tables "next_daily_actions" and "last_version_check" no longer exist access_permission_checks ". May I have to update my mysql from version 5.6.20 to a more advanced one? Or I do not know if it's something from the configuration of my local server. I apologize if my English is not very readable because I use the google translator and only God knows what that translator will be saying. I made a new clean installation and I kept giving the same problem and I think it will be because of my local server which is very outdated. What I did next was to make a clean installation but with the "install.sql" of version 2.4.18.1 and everything works perfect, but of course, in "mlf2_temp_infos" the tables "next_daily_actions" and "last_version_check" no longer exist "access_permission_checks". What I did next was to make a clean installation but with the "install.sql" of version 2.4.18.1 and everything works perfect, but of course, in the table "mlf2_temp_infos" the rows "next_daily_actions", "last_version_check" and "access_permission_checks" no longer exists. Yes, before version 2.4.19 the table mlf2_temp_infos should be empty directly after the installation. The rows last_version_check and last_version_uri should get added with the first check for a newer version. The other rows (access_permission_checks, last_changes, next_daily_actions and version) was moved from the settings table with the update to version 2.4.19. So with the install.sql from version 2.4.18.1 these rows are not present in this table. The forum requires PHP in the version 5.4.x or higher and MySQL in Version 5.0 or higher. With MySQL 5.6 you are on the way and also your mentioned PHP version of 5.4.30 is good enough to run the forum. On the other hand a can't say anything about your server configuration. I found the reason for this and another bug. I made false assumptions about the availability of a function and – that's relevant for your problem – about the structure of the return value of another function. I provided and presented a fix for your report (relevant content begins with "And there is a further code change.") and also for the other issue, reported by Magma. A new version will be ready on todays evening (central european time/CET). Hello again, I am very happy that it could be solved, because it is an application of the best that I have tried and I am delighted with it. Thank you very much for your effort and dedication.